Bhavan’s Shri I. L. Pandya Arts, Science and Smt. J. M. Shah Commerce College 1, Dakor - 388225, Gujarat, India. P. G. Center in Chemistry 2, Smt. S. M. Panchal Science College, Talod - 383215, Gujarat, India. LDRP-Institute of Technology & Research 3, Kadi Sarva Vishwavidhayalay University, Gandhinagar -382024, Gujarat, India. Department of Physics 4, Sardar Patel University, Vallabh Vidyanagar - 388120, Gujarat, India. 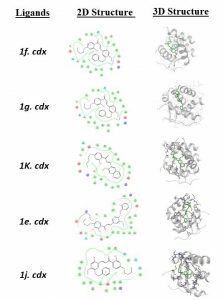 ABSTRACT: Chalcone based structures have many interesting biological properties like anti-malarial, anticancer, antiviral, antibacterial, antifungal, anti-hyperglycaemic and photo-cytotoxicity activities. In this study, the novel chalcone derivatives (1a-1l) have been synthesized and investigated for antimicrobial activities. The MIC results of antimicrobial activities reveal that one of the chalcone derivative (2-Br- and 4-OCH3- group) against specific bacteria are quite significant. 3D QSAR, three dimensional quantitative structure activity is one of the most powerful technique which involves the quantitative relationship between the biological activity of a set of compounds and their three dimensional structural properties, using statistical correlation methods. Pharmacophore modelling and molecular docking play an important role in drug design. To elucidate the relationship between structures and its activity, field-based 3D QSAR analysis has been carried out of novel chalcone derivatives. Structural properties such as electrostatic, hydrophobic, aromatic, and hydrogen-bond donor and acceptor have been worked out for novel chalcone derivatives. To investigate the influence of drugstore, chalcone derivatives (1a-1l) have docked with receptor 2IOK and results displayed the highest Gscore of ligand 1f (3-OCH2C6H5-4-OCH3- group). INTRODUCTION: Chalcone is an aromatic ketone and an enone that forms the central core for a variety of important biological compounds, which are known collectively as chalcones. The presence of a reactive α, β unsaturated keto function in chalcone found to be responsible for their anti-microbial activity. Chalcones have natural products that can also be obtained synthetically using a relatively simple synthesis procedure. The general method applied to synthesize chalcone is the Claisen - Schmidt reaction, while a modern alternative to synthesize chalcones uses the palladium-catalyst cross-coupling reactions of styryl tri-fluoroborates with benzoyl chlorides 1. Chalcone derivatives have well known for their broad spectrum of pharmacological activities, including radical scavenger 2, anti-hepatotoxic 3, anticancer 4, antifouling agents 5, anticorrosive agents 6 and antimalarial properties 7. Some chalcones having hydroxyl, alkyl, halogen (Cl, Br, I, etc.) groups in different position have been reported to possess anti-bacterial 8 and antifungal 9 activities. Chalcones have very well-known antibacterial agents, and they exert their activity through cell membrane interruption 10. In this contest and as a part of our continuing research of drug design and biological investigations of chalcone derivatives 11, 12, we report the synthesis of novel chalcones and its biological activities with 3D QSAR and docking studies. 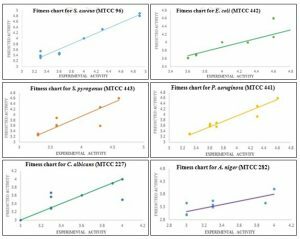 This study has revealed the screening of the microorganisms; antibacterial and antifungal activities testing of a series of synthesized chalcones. Quantitative structure-activity relationships (QSAR) is a method used to find relationship between physicochemical properties of chemical substances and their biological activities 13. The protein-ligand interaction has played a significant role in structure-based drug designing. To understand pharmacological data on a structural basis, we evaluate the designed compounds through the docking technique. We performed the 3D molecular docking of these analogs on a crystal of human estrogen receptor (2IOK, PDB) to evaluate the binding energies as well as their mode of interaction. Synthesis: The synthetic pathway of novel chalcone derivatives (1a-1l) was outlined in Fig. 1. The target molecules consist of three steps; therefore the synthetic strategy involves the preparation of 1-(2, 4-dihydroxyphenyl) ethanone (step-I) by anhydrous zinc chloride dissolved in glacial acetic acid and resorcinol was added in it 14. In the next step-II, 1- (2, 4- dihydroxyphenyl) ethanone (product of step-I), anhydrous potassium carbonate and butyl iodide in dry acetone was refluxed for 48 h. The ended solid product was separated, washed with water, dried and crystallized from petroleum ether. At last, a series of relieved 3-(substituted phenyl)-1-(2-hydroxy-4-butoxy phenyl) prop-2-en-1-ones, chalcone derivatives (1a-1l) were prepared by simple reaction with an ethanolic solution of 2-hydroxy -4 -butoxy acetophenone and 2, 5 -dimethoxy benzaldehyde (1c) in the presence of potassium hydroxide. The reaction mixture was stirred at room temperature for 24 h (step-III). Antibacterial and Antifungal Activities: Inhibition of bacterial and fungal growth by a compound is an indication of its capability to prevent the development of microorganisms. In-vitro antibacterial and antifungal inhibitory activities (minimum inhibitory concentration, MIC) of synthesized compounds were determined by the microdilution broth assay method 15. Serial dilution technique was followed by the micro method as per NCCLS-1992 manual 16, 17. Muller Hinton broth was used as a nutrient medium to grow the strains and dilute the drug suspensions for the test. Serial dilutions were prepared in primary and secondary screening. The control tube containing no antibiotic is immediately sub-cultured (before incubation) by spreading a loop evenly over a quarter of a plate of medium suitable for the growth of the test organism and incubated at 37 ºC for 24 h. The MIC of the control organism is read to check the accuracy of drug concentrations. The lowest concentration that inhibits the growth of the organism is recorded as the MIC Table 1. The amount of growth from the control tube before incubation (which represents the original inoculum) was compared. The synthesized chalcone drugs (1a-1l) were dissolved in DMSO to extend a final diluted concentration of 2000 μg/mL, as a stock solution. In primary screening 1000, 500, 250 and 125 μg/mL concentrations of the synthesized drugs were taken. The active synthesized drugs found in this primary screening were further tested in the second set of dilution against all microorganisms. The drugs found active in primary screening were similarly diluted for secondary screening to obtain 100, 50, 25, 12.5, 6.250 μg/mL concentrations. The highest dilution showing at least 99% inhibition is taken as MIC. The result of this test is affected by the size of the inoculum. The test mixture should contain 108 organisms/ mL. The standard drug Gentamycin used in the present study for evaluating antibacterial activity which showed 0.25, 0.5, 0.05 and 1.0 μg/mL MIC against bacterial strains S. aureus, S. pyogenes, E. coli and P. aeruginosa respectively. K. Nystatin is used as the standard drug for antifungal activity, which showed 100 μg/mL MIC against both the species. 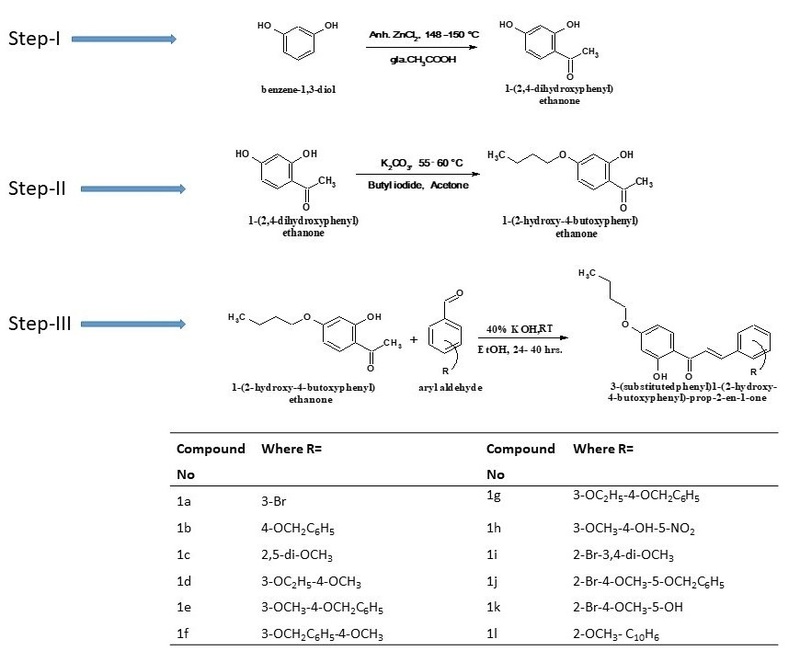 Methodology: A set of 12 novels synthesized chalcone derivatives [1a-1l] having antibacterial and antifungal activities used for 3D QSAR analysis. The 3D-QSAR and Molecular docking studies carried out using Maestro 10.1 molecular modeling package from Schrodinger, Molecular Modelling Interface Inc., LLC, New York, NY USA 18. The 3D QSAR study has provided support for lead discovery, SAR development, lead optimization, and lead expansion. The biological activity data are in the form of IC50, and these values are converted into pIC50 using the formula, pIC50 = 6-log IC50. Preparing Ligands: LigPrep 18 has used to attach hydrogens and to convert the 2D structure to its 3D and generate stereoisomer and optionally, neutralizes charged structures or to determines the most probable ionization state at user-defined pH. The LigPrep process consists of a series of steps that perform conversions, apply corrections to the structures, generate variations on the structures, eliminate unwanted structures, and optimize the structures. Many of the steps are optional and are controlled by selecting options in the LigPrep panel or by specifying command-line options. The various process of viz. convert the structure format, select the structures, add hydrogen atoms, remove unwanted molecules, neutralize charged groups, generate ionization states, generate tautomer, filter the structures, generate alternative chirality, generate low-energy ring conformations, remove problematic structures and optimize the geometries have performed by ligand preparation. All the minimized structures are imported in Field-based QSAR module and appropriate protonation states assigned at physiological pH to 7.4 ± 0.0. OPLS-2005 force field method is applied for energy minimizations of dataset structures. The most important input, the alignment of molecules is carried out using the flexible ligand alignment method Fig. 2. For accurate and reliable predictions of biological activities of new compounds, the main target was to develop QSAR models, which were statistically robust both internally as well as externally. The data set has alienated into a training set, and a test set as external validation is considered to be conclusive proof for judging predictability of a model. The dataset was divided into a training set (70%) and test set (30%) in a random manner Table 2. The training set has been used to generate a pharmacophore model, and prediction of the activity of the test set has applied for a method to validate the proposed models. Validation has a crucial aspect of pharmacophore design, particularly when the model built to predict activities of molecules in an external test series. The correlation between the experimental and predicted activities of the test set molecules have been determined. The overall performance of various pharmacophore models concerning different statistical parameters such as R2, Q2, Pearson-R, SD, RMSE, and F-value have used for the selection of the best QSAR model. Receptor Preparation: The protein structure of human estrogen receptor Fig. 3 retrieved from PDB (2IOK). X-ray structure of human estrogen receptor alpha ligand-binding domain in the complex has been taken from the protein data bank (2IOK) having a resolution of 2.4 Å. A typical PDB structure file consists only of heavy atoms, can contain waters, cofactors, and metal ions. Glide calculations use an all-atom force field for accurate energy evaluation. The proteins are prepared using the Protein Preparation Wizard. Pre-processed bond orders assigned, hydrogens added, metals are treated and water molecules are deleted. The protein has optimized from its raw state with RMSD of 0.3 Å and OPLS_2005 force field minimization. Molecular Docking Study: Molecular docking, basically a conformational sampling procedure in which various docked conformations are explored to identify the right one. The ligands have docked with the active site using the ‘Extra precision’ Glide algorithm. Glide uses a hierarchical series of filters to search for possible locations of the ligand in the active-site region of the receptor. Final scoring of docked ligand has carried out on the energy-minimized poses Glide score scoring function. Glide Score is based on chem score, but includes a steric clash term and adds buried polar terms devised by Schrödinger to penalize electrostatic mismatches. vdW- Vander wall energy; coul- coulomb; ipo- lipophilic contact term; BuryP-penalty for buried polar groups; RotB-penalty for freezing rotatable bonds; site-active site. GLIDE provides three different levels of docking precision: HTVS-high-throughput virtual screening; SP-standard precision and XP-extra precision. Receptor grid generation is accomplished using GLIDE with the XP (Extra Precision) protocol. 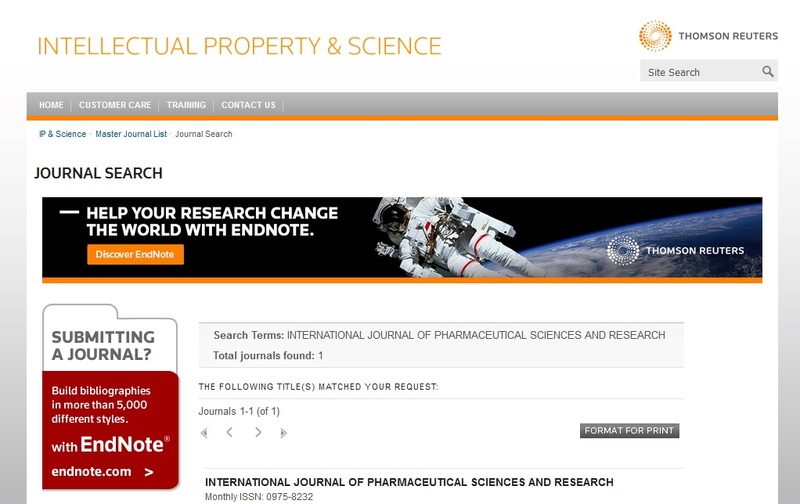 The XP scoring function comprises four components: Ecoul (Coulomb energy), Evdw (Van de Waals’s energy), Ebind (items favoring binding), and Epenalty (items hindering binding). Since the protein keeps rigid, the surface of a ligand is “softened” by scaling the van der Waals radii of nonpolar atoms to decrease penalty caused by close contacts. The scaling factor is 0.8, while the partial charge cutoff is 0.15. RESULTS AND DISCUSSION: A model of the biological target is built based on the knowledge of the type of bind and this model, in turn, may be used to design new molecular entities those interact with the target molecule. A 3D QSAR analysis has been performed successfully on the set of twelve novels synthesized chalcone derivatives [1a-1l] to understand the effect of the spatial arrangement of structural features on their antibacterial and antifungal activities. All the 12 compounds are aligned on the generated pharmacophore model and randomly divided into a training set 70% (8 molecules) and a test set 30% (4 molecules) for all antibacterial and antifungal activities. The training and test compounds structures with their actual and predicted activities are presented in Table 2. The number of PLS factor included in model development is 5. The PLS statistical parameters of 3D- SAR for bacterial and fungal activates have shown in Table 3. The values of F for both bacterial and fungal Table 3 have very high and indicates a statistically significant regression model. The small values of the variance ratio (P) has shown a high degree of confidence. 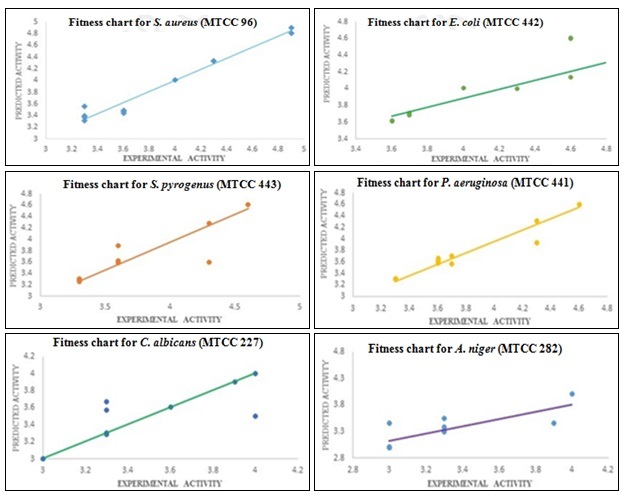 The correlation graph between predicted and actual activity pIC50 of all data (training and test) set is depicted in Fig. 4. 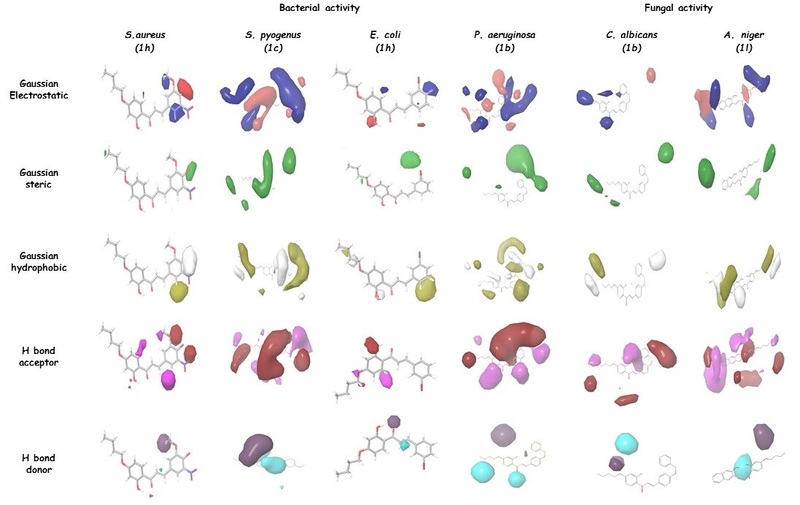 In order to gain additional insights into the nature of interactions of the ligands with receptor, we analysed the 3D QSAR models based on most active compounds for bacterial activates, 1h for S. aureus, 1c for S. pyogenus, 1h for E. coli and 1b for P. aeruginosa and for fungal activities 1b for C. albicans and 1l for A. niger using Gaussian steric, Gaussian electrostatics, Gaussian hydrophobic, Gaussian H-bond acceptor and Gaussian H-bond donor which can be visualized in Fig. 5. The van der Waals potential and Columbia terms represent the steric and electrostatic terms respectively. The Fig. 5 displays the steric regions around the molecules 1h, 1c, 1h, and 1b for S. aureus, S. pyogenus, E. coli, and P. aeruginosa micro-organisms respectively and for fungous C. albicans and A. niger respectively. The presence of electrostatic interactions in both the case of microorganisms and fungus; wherein the blue and red region express the presence of electrostatics groups in the selected compound. Fig. 5 exposed hydrophobic region at aromatic rings which indicate the presence of hydrogen bond donor and accepter area. Molecular Docking Study: Protein-ligand interaction plays a significant role in structure-based drug designing. To understand pharmacological data on a structural basis, we evaluate pharmacophore activity for the synthesized compounds through the docking technique. The protein structure of human estrogen receptor Fig. 3 is retrieved from PDB (2IOK). Glide program is used for molecular docking. Glide searches for favorable interactions between one or more ligand molecules and a receptor molecule, usually a protein. The structure is then corrected using the builder module of Maestro-Molecular modeling program; this involved the adding of missing residues, hydrogen atoms, appropriate bond-order, as well as removing of water and fixing proper atom-types. Glide protein preparation program to optimize the structure. For ligand preparations for docking experiments, ligand molecules are drawn in Chem. Office 10.0 and converted into Pdb form and after minimization using molecular modeling program in maestro. The synthesized chalcone derivatives (12 compounds) with are docked into the active site of the protein 2IOK. The results are characterized by the XP G-scores obtained from GLIDE (Grid-based Ligand Docking with Energetic) docking Table 4. The docking pose in terms of the Glide energy of binding is analyzed to clarify interactions between derivatives of synthesized chalcone compounds and target binding site of the 2IOK receptor structure. Comprehensive analysis of the docking poses showed that compounds 1f, 1g, 1k, 1e, 1j, 1a, and 1b have good docking score. From our results it is seen that compound 1f has highest docking score, i.e., 11.54, so the compound 1f is supposed to have maximal activity. The results of the docking studies are presented in the form of G-score, Glide energy and H bond interactions values. The G-scores are presented as negative values, indicating that more the negative values more are the binding interactions. 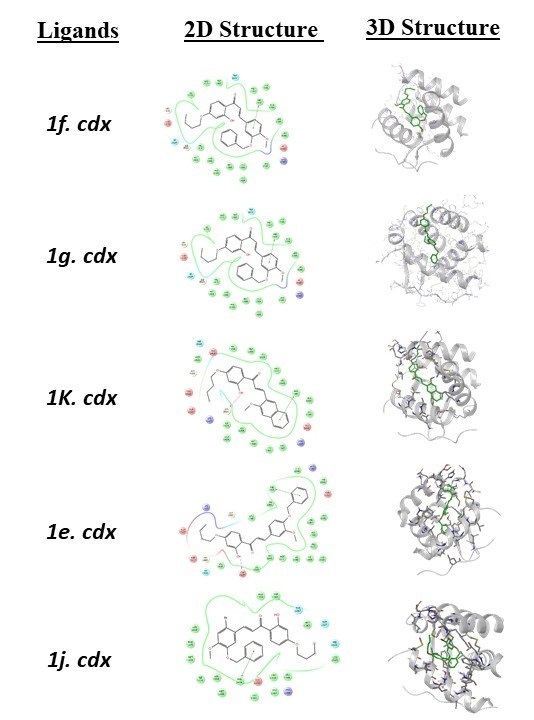 The 2D sketch of binding interactions and 3D designed docked view of the 1f, 1g, 1k, 1e and 1g ligands with 2IOK human estrogen receptor have shown in the Fig. 6. The synthesized compound 1f is found to display a good binding affinity to the receptor. The 2D, 3D and surface view of the 1f ligand with receptor has shown in Fig. 7. It shows the pi-pi interaction with PHE and packed in the cavity of the protein human estrogen receptor, presented by the red circle. 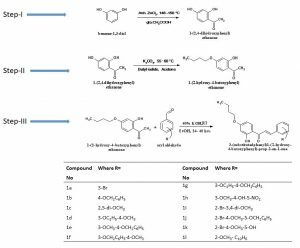 CONCLUSION: The chalcone derivatives (1a-1l) have been synthesized and tested against antibacterial and antifungal agent and exploring the identified derivatives with reasonable inhibitory activities against Staphylococcus aureus (MTCC-96), Escherichia coli (MTCC-442), Streptococcus pyogenes (MTCC-443), Pseudomonas aeruginosa (MTCC-441), Candida albicans (MTCC-227) and Aspergillus niger (MTCC-282). The compounds tested, 1h and 1k displayed better activities against gram-positive Staphylococcus aureus bacteria with the MIC value of 0.12 mg/mL. The compounds 1b, 1e, 1h, and 1l, displayed significant activities against fungal strains. A 3D QSAR analysis has been performed successfully on the set of novel synthesized chalcones derivatives to understand the effect of the spatial arrangement of structural features on bacterial and fungal activities. 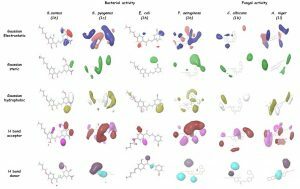 This ligand-based 3D QSAR model could be very useful for virtual screening and lead optimization for the identification and development of better inhibitory potential molecules against these bacteria. A model of the biological target is built based on the knowledge of the type of binding and this model, in turn, may be used to design new molecular entities that interact with the target molecule. The 3D-QSAR visualization has been shown favorable regions on most active compounds using Gaussian steric, Gaussian electrostatics, Gaussian hydrophobic, Gaussian H-bond acceptor and Gaussian H-bond donor. Molecular docking of the compounds has been carried out for the better understanding of the drug-receptor interaction. Docking simulation studies have shown that these compounds have bound mainly with the substrate binding site PHE of human estrogen receptor (2IOK) and will be quite useful as the lead compounds for developing inhibitors. The docking results show the highest G-score for ligand 1f with receptor 2IOK. 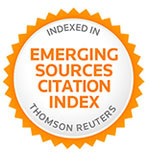 ACKNOWLEDGEMENT: We are thankful to UGC-DSA, New Delhi for providing Schrödinger software. Al-Masum M, Eunice N and Wai MC: Palladium-catalyzed direct cross-coupling of potassium styryl trifluoroborates and benzoyl chlorides-A one-step method for chalcone synthesis. Tetrahedron Lett 2011; 52: 1008-1010. Kim BT, Chun JC and Hwang KJ: Synthesis of dihydroxy-lated chalcone derivatives with diverse substitution pattern and their radical scavenging ability toward DPPH free radicals. Bull Korean Chem Soc 2008; 29: 1125-1130. Khan SA, Ahmed B and Alam T: Synthesis and anti-hepatotoxic activity of some new chalcones containing 1, 4-dioxane ring system. Pak J Pharm Sci 2006; 19: 290-294. Yoon G, Kang BY and Cheon SH: Topoisomerase I inhibition and cytotoxicity of licochalcones A and E from Glycyrrhiza inflat. Arch Pharm Res 2007; 30: 313-316. Xu Q, Barrios CA, Cutright T and Newby BMZ: Evaluation of toxicity of capsaicin and zosteric acid and their potential application as antifoulants. Environ Toxicol 2005; 20: 467-474. Bouklah M, Hammouti B, Aouniti A, Benkaddour M and Bouyanzer A: Synergistic effect of iodide ions on the corrosion inhibition of steel in 0.5M H2SO4 by new chalcone derivatives. Appl Surf Sci 2006; 252: 6236-6242. Awasthi SK, Mishra N, Kumar B, Sharma M, Bhattacharya A, Mishra LC and Bhasin VK: Potent antimalarial activity of newly synthesized substituted chalcone analog in-vitro. Med Chem Res 2009; 18: 407-420. Nielsen SF, Larsen M, Boesen T, Schonning K and Kromann H: Cationic chalcone antibiotics. Design, synthesis and mechanism of action. J Med Chem 2005; 48: 2667-2677. Patel UH, Gandhi SA, Barot VM and Patel MC: Synthesis, spectroscopic investigations, quantum chemical studies (Ab-initio & DFT) and antimicrobial activities of 3-(3-Chloro-4, 5-dimethoxy- phenyl)-1-(4, 5-dimethoxy-2-methyl- Phenyl) prop-2-en-1-one. Crystal Struct Theory Appl 2013; 2: 167-175. Patel UH, Gandhi SA, Barot VM and Patel MC: A comparative study of novel chalcone derivative by X-ray and quantum chemical calculations (Ab-initio and DFT): Experimental and theoretical approach. Mol Cryst Liq Cryst 2016; 624: 190-204. Kubinyi H: QSAR and 3D QSAR in Drug Design. Part 1: Methodology, Drug Discovery Today, 1997; 2: 457-467. Robinson R and Shah RC: Some homologs of resorcinol. J Chem Soc 1934; 322: 1491-1498. Candan F, Unlu M, Tepe B, Daferera D, Polissiou M, Sokmen A and Akpulat A: Antioxidant and antimicrobial activity of the essential oil and methanol extracts of millefolium subsp. millefolium Afan. (Asteraceae). J Ethnopharmacol 2003; 87: 215-220. Michael AP: Reference Method for Broth Dilution Antifungal Susceptibility Testing of Yeasts; Approved Standard-Second NCCLS document M27-A2 [ISBN 1-56238-469-4]. NCCLS, 940 West Valley Road, Suite 1400, Wayne, Pennsylvania 19087-1898 USA, 2002. Monks A, Scudiero D, Skehan P, Shoemaker R, Paull K, Vistica D, Hose C, Langley J, Cronise P, Wolff AV, Gray-Goodrich M, Campbell H, Mayo J and Boyd M: Feasibility of a high-flux anticancer drug screen using a diverse panel of cultured human tumor cell lines. JNCI: Journal of the National Cancer Institute 1991; 83: 757-766. Friesner RA, Murphy RB, Repasky MP, Frye LL, Greenwood JR, Halgren TA, Sanschagrin PC and Mainz DT: Extra Precision Glide: Docking and Scoring Incorporating a Model of Hydrophobic Enclosure for Protein-Ligand Complexes. J Med Chem 2006; 49: 6177-96. Gandhi SA, Barot VM, Patel MC, Malek TJ and Patel UH: Molecular docking, pharmacophore modelling and 3D QSAR analysis of novel chalcone derivatives. Int J Pharm Sci & Res 2019; 10(4): 1725-33. doi: 10.13040/IJPSR.0975-8232.10(4).1725-33.